Author Michael Lewis may reportedly get paid around $10 per word for his simple yet stunning prose, but The Blind Side notwithstanding (and that one left a lot of the original source material on the chopping block), his books have always seemed like kind of an odd choice to adapt for the silver screen. One needs only to look only as far as Bennett Miller's 2011 take on Moneyball — a book about a bunch of stats nerds' cold and calculated analysis of America's favourite pastime and the ways to better the game — to see why (most of the math was eschewed in favour of raw emotion, namely Brad Pitt throwing things). Because of this, it may seem strange that Frat Pack-associated writer-director Adam McKay decided to retell the story of Lewis's 2010 best-selling book on America's housing and credit bubble and the way it burst in 2008, but his penchant for comedic storytelling is, in a weird way, the perfect fit for The Big Short, a film that will make you equally angry and compelled, and will likely stay fresh in your mind going into awards season. Based on a true story, the film follows a mismatched crew of academics and financial analysts who — whether working together or alone — all ended up discovering a major flaw in the way mortgages were doled out with little foresight or responsibility for the average person, then decided to bet against the banks in the event of a full-on financial crisis and economic collapse while getting handsomely rich in the process. 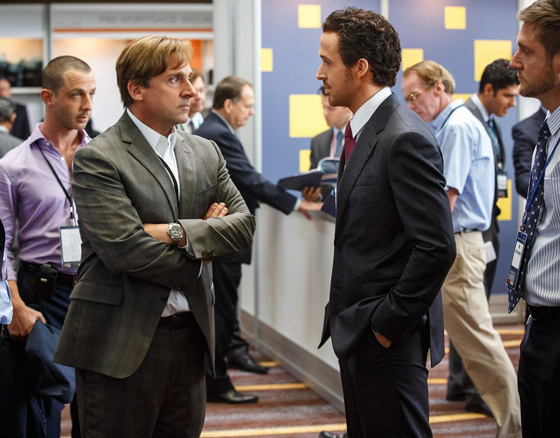 What's interesting about The Big Short, unlike most other dramas, is that the audience (if they're of a certain age) already knows how it ends, but that doesn't mean the ride to the bottom is any less enjoyable (especially thanks to powerful performances from the likes of Steve Carell, who looks a strong candidate to take home Oscar gold with his portrayal of the ruthless and morally confused investor Mark Baum, as well as Ryan Gosling, whose fake-tanned face looks extremely punchable as Wall Street weasel Jared Vennett) or informative (in case you couldn't understand the world's financial collapse the first time around, Margot Robbie, Anthony Bourdain and Selena Gomez, all playing themselves, lay it out for us in some of the film's more pointed and silly asides). Those looking for Anchorman-like laughs this holiday season may be let down, but The Big Short offers something far more worthwhile: some of the most thought-provoking and emotional scenes you're going to see onscreen this year.